Some people seem to think that only old or disabled people use sticks - think again! Children brought up in the countryside do not appear to have the idea that sticks are just for old people! 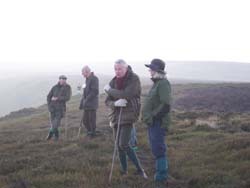 Long sticks are more use than shorter ones for hill walking. Ascending - and particularly descending - are made easier with a stick. After a long walk a stick can provide a few moments rest as you lean on it and let it take some weight while you look at the scenery or have a chat. What a view! You deserve to have a rest after you've climbed up to the top of the hill. 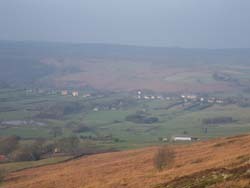 This is a view from one of the ridges on the North York Moors. A view from the top of the cliffs at Kettleness, near Whitby. 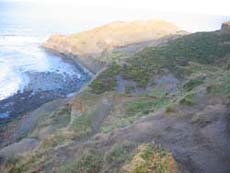 This is on the Cleveland Way long distance walk and a stick is a real help on steep and slippery ground. 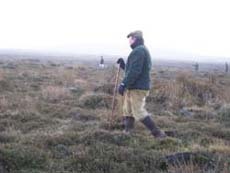 A huntsman strides out with his Beagles. 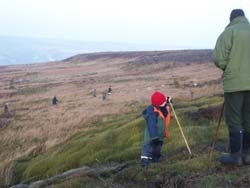 A long stick such as this Thumbstick is a useful and traditional tool on the hill.